"I was looking for Mom for a Dutch program and came across a program about Toronto. We knew of the problems they were having with the generator going out, but we had no idea how close we came to not having the Friday concert. Even when they started things were not right. André was already thinking about what he could do if they had to cancel. He would offer a Sunday afternoon concert. Can you imagine what that would have cost him if they had not been able to have the concert ~ Amazing. It is in Dutch, but worth watching. Lots of sentimental hugs and tears. 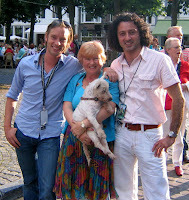 Fourth of July With The Dutch Girl ~ Maastricht Style!! Dutch people stopped us on the streets to say "Happy Birthday" to us. André on the Vrijthof Being Interviewed by "60 Minutes"
Here is the link to a 15 minute video of Australian 60 Minutes interview with André that was televised last night. It alternates with interviews with André and Andrea Bocelli. Betty and I watched the part in the above picture with André when we were eating our lunch at a cafe on the Vrijthof early in the week. They were right in front of us on the left side of the Vrijthof. Pierre was actually there too, just to the right of André. After the interview, Pierre and André hugged good bye and went different directions. 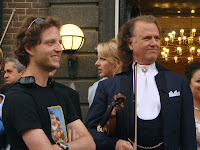 If Orange (color of the Dutch soccer team) does not go to Vienna, than André Rieu will bring Vienna to the Netherlands. Friday evening, the waltz king magically changed the Amsterdam ArenA with his replica of Schloss Schönnbrunn. It is quite a sight, André Rieu, riding a ladies bicycle in between the empty rows of seats in the empty Amsterdam ArenA. From the stage to the sound control area in the back of the stadium. While the Johann Strauß Orchestra is practicing, the waltz king listens to his musicians in a very concentrated manner. He then turns to his technicians on the mixing panel; “That echo will disappear, won’t it? 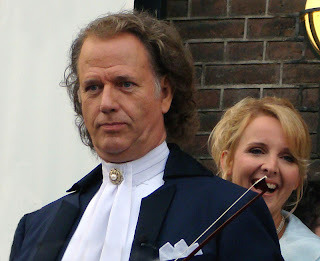 That is André Rieu at his best. A perfectionist who ensures that every minute detail of his mega concert is carried out precisely. Specifically in the area of the music. Take for instance the roof of the ArenA which will be covered with meters and meters of cloth. Not only to control the light coming into the arena, but also to improve on the acoustics. 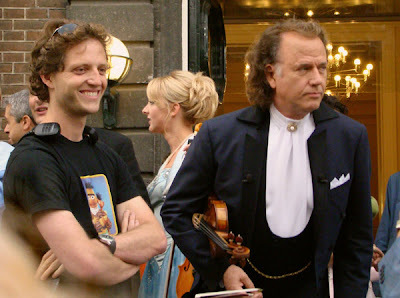 The Maastricht stand alone violinist really keeps an eye on everything. The golden carriage with six white horses from Austria has to be brought to a halt in front of the stage at the exact moment when the last notes of “Trumpet Voluntary” are played. To achieve that, the entrance of the carriage—which will carry Empress Sisi during the concert---will be rehearsed again. It is six PM, the first of two huge shows in the soccer stadium. Up until now, only those who attended the concerts in Toronto or Düsseldorf, Germany, could view the mega decor with their own eyes. Now for the first time, the replica of the Austrian palace Schönnbrunn stands proudly on Dutch soil. 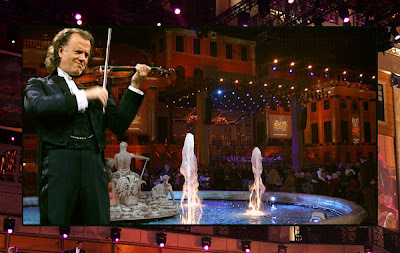 Earlier during the day, the 58 year old orchestra leader said in a radio interview that he was going to treat the audience to a nice evening in Vienna. What the Dutch soccer team could not accomplish during the European Championship, Rieu makes it a reality in his home country. 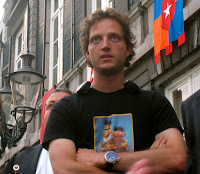 If the Dutch team had reached the finals, he was ready to travel with his orchestra to Austria. Alas, it was not meant to be. But, the 26,000 concertgoers in the sold old stadium are not letting that affect them. While Dad is rehearsing on the stage, son Pierre (27) watches him. 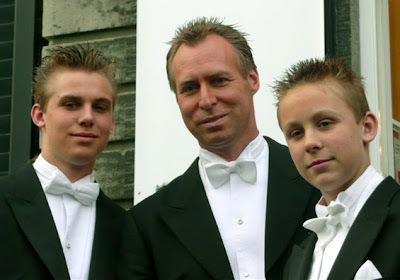 In the same radio program he had a request for his father and asked him to play: “Ich bau Dir ein Schloss” (I build you a castle) sung by Heintje, also a Limburger phenomenon. Would that not be fitting? Proudly he looks at that impressive palace, which for the ArenA was a shorter version without a roof, or it would not fit in the soccer temple. ”When, two years ago my Dad asked me if I could copy the Schönbrunn, without hesitation I answered-- yes”. 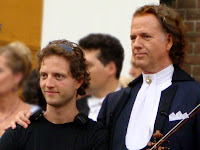 So, Pierre Rieu pulled out all the stops. The biggest portable stage ever, including a ballroom and two ice rinks. That during the concerts presents an impressive picture as tens of Viennese Debutants waltz in the ballroom and float across the ice. 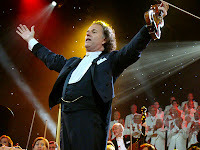 It also appears that André Rieu has successfully conquered the acoustical problem—something that has played havoc with other concerts conducted in the ArenA. A gigantic production like this takes months in preparation. “For this we have a special construction book” says Pierre Rieu. “Everything is properly coordinated, otherwise it would be impossible to have the stage and lighting, sound and catering all appear in the same place. We present total entertainment. 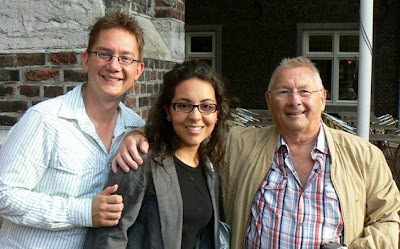 This for us is also a “thank you” to the Dutch public who supported André from the very beginning”. Could it even get bigger? “For us, that is not necessary. You can, for instance, copy the Eiffel tower, but for us, with this palace, we are contend for a long time. We would like to conquer South America. We have never been there. The people there will also get to see this castle”. Thank you to John for getting and translating this for us!! 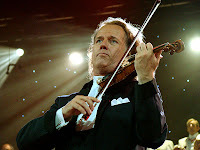 During a late meeting 6 July, André Rieu had yet another surprise up his sleeve. After being assured by Nick Janssen (Staar Director) that the Staar would be free for these dates, André indicated that he wanted the Staar to accompany him and perform with him in the Gelredome in Arnhem for his Christmas concert on 19 December. He also plans to include the Staar in his concert July next year in the Amsterdam ArenA. The members of the Staar, who according to Rieu have become quite a team, acknowledged this news with thunderous applause. Thank you to John for getting and translating this for us! What a Weekend, What a Concert, What fun!!! "Stadtpark" for the fan picnic. There were already many fans from all over the world. It was fantastic to meet so many well known faces again and to get know so many new people in person. We laughed, ate, drank and of course I took a lot of pictures. THANKS you are all great. And next year we'll see each other all again. After a few hours talk I went to the sound check. 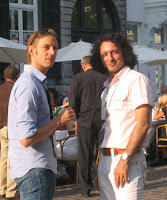 I was surprised how relaxed the mood is in Maastricht. You would think fans and the JSO are one big family. All, the members from the orchestra, the platin tenors, the "singing girls", were so friendly and made pictures together with you and everybody spoke to you. 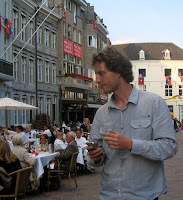 Now I really know that the atmosphere in Maastricht is very special. Of course there was the big Maestro there too. He looked great in the black suit and the sunglasses. The sound check was funny. For me it was the first time I had seen it. I knew André on his bicycle until then only from the T.V. 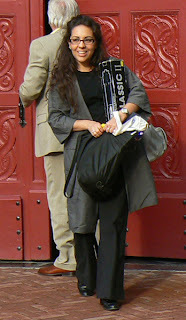 The first highlight was the string orchestra from the music school in Maastricht. Which consists of about 100 children. They played the "Irish Washerwoman". After the break came my absolute goosebump feeling. 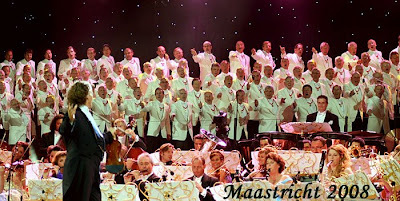 The Maastricht Staar (a mens choir which consist of over 150 men) came with burning torches to the song "Conquest of Paradise". It seems that nobody breathed. Such a silence. I was fascinated too with the 13 years old Melissa. Sensational how she plays the trumpet at this age. Than came Mirusia as "Outback girl" on the stage. She looked so cute. First she sang "Waltzing Matilda" and than another Australian song which I didn't know before. It's called "Tie me kangaroo down, sport". 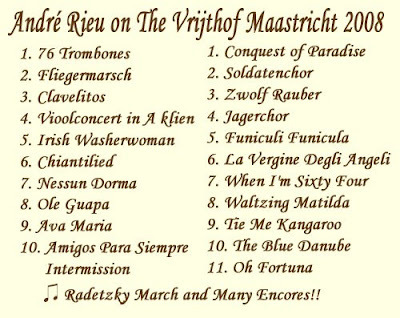 In the refrain the chorus, Mirusia and of course André did kangaroo jumps. I was so enthusiastic that I did the same the second time. I was nearly the only. No matter. After the concert I went of course to the "alten Vogelstrauß". There everybody meets after the concert. Fans, members from the orchestra, EVERYBODY!!! And I found my new favourite drink there. "Bessin Genever". Fantastic! It was as always very late or better early when I went home. But I'm not in Maastricht to sleep. It was a fantastic weekend and I'm really looking forward to next year. THEN IT CONTINUES!!! But first I'm looking forward to when it comes in the middle of August on the German T.V. and of course towards the DVD. Here is the link to Simone's Photoshow if you haven't already seen it. 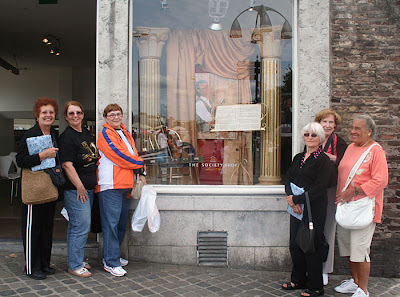 Some Fun Pictures of Maastricht From Adele! 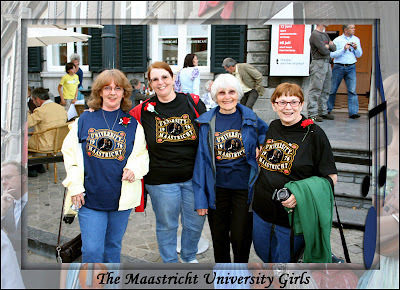 Click on link below For Maggie's Report on her weekend in Maastrict! 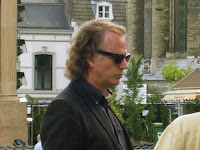 I am working on ALL the photos from all the fans to put in the "Maastricht 2008 Photoshow" ~ Every once in awhile I come across some that I just have to put on here so you can see them now. 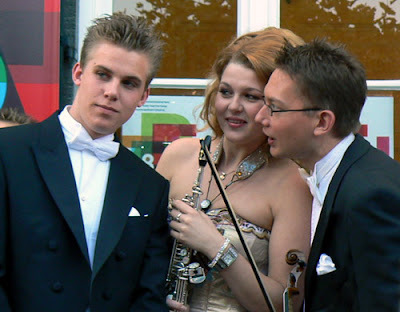 I just love these three that were in Maggie's pictures of André and Pierre. I wanted to post them now, as it will probably be a week before the Photoshow is done. 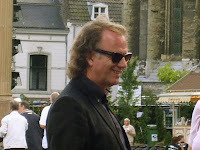 THREE Falize's in André Rieu's Maastricht Concerts! 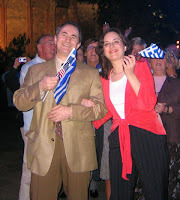 After the concert, the fans realized that Andre used to call his Stradi a female friend (because of the shapes)... So what is happening here? 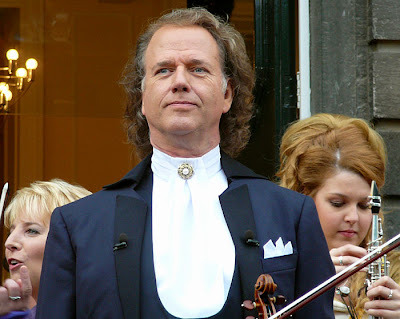 André Rieu Saturday in Maastricht! Where The Maastricht Fan Banners Come From! 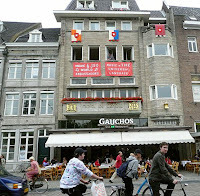 I wanted to take a break from all the Maastricht Concert News and give a Big Thank You to Ineke who every year makes our Banners that go on the front of the DuCasque Hotel for all to see. 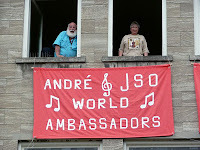 When André is on stage and looking straight ahead, he is looking right at our Banners! When I'm sitting in my window at the hotel, I see SO many people taking pictures of her Banners!! 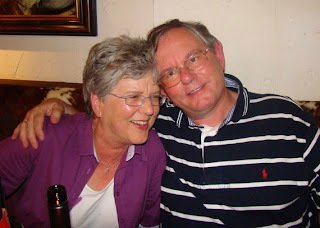 We know a lot of work goes into them and Ineke ~ "We ALL Thank You!!" These are a couple of great pictures that Al Girard took. The link below is a video that Al made of Andre's Marching Band. You have all seen it in many of our pictures and now you can see and hear it!The Band marches around the Vrijthof and then through the Vrijthof for about an hour while André is standing on the Theater Steps. If you could only see his face each time they come around ~ it lights up like a boy on Christmas morning! He LOVES this Marching Band and it sure gets everyone in the festive mood! UPDATE: How GREAT is this!?! 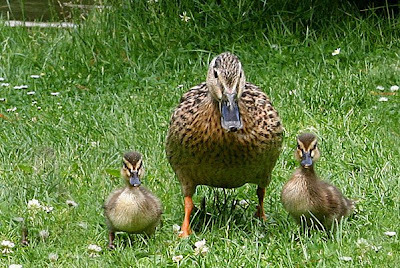 Our Special "Feathered Dutch Guests" at The Fan Picnic! I have been doing photos of André and Company for three days straight now and this morning I was looking at some of my own pictures and came across this one that I took of our Special Guests at the fan picnic and started laughing. I decided to put them on here. 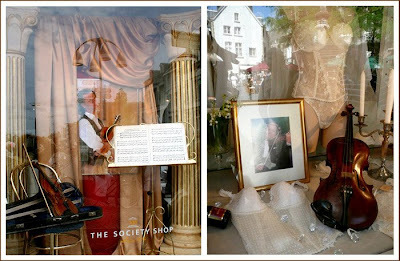 Here is a Photoshow of Pictures from Peggy in Germany. 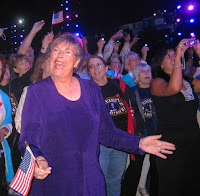 There are some of the Sound Checks, Carla, Carmen and Suzan and others.